What can you not do with a crockpot? This modern marvel has taken over our kitchen! We roasted up this whole chicken in the crockpot with only a ten-minute prep. This is a “set-it-and-forget-it” juicy, roast chicken treat. 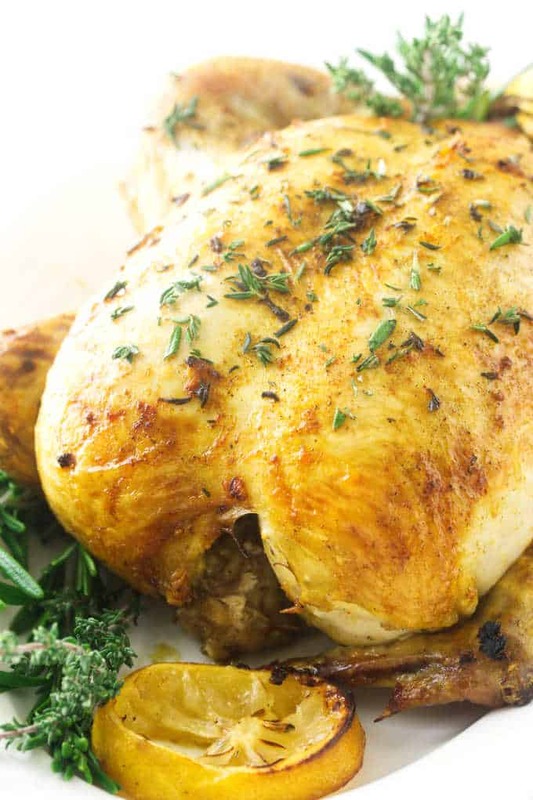 This wonderfully moist and tender herb roasted whole chicken can be your family’s Sunday supper. It is a quick prep, put it in the crockpot, set it and forget it for five hours! Then just a quick browning under the broiler to pretty it up. 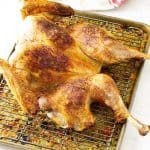 You will agree that it is easier than a traditional oven-roasted chicken and much juicier. 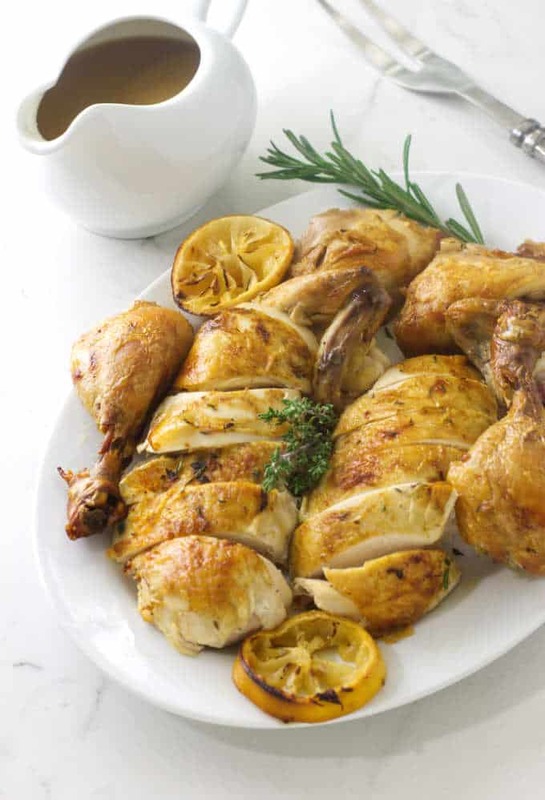 Oh, there is so much you can do with a roasted whole chicken! 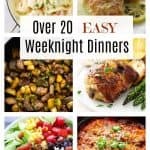 This is a fast prep and an easy main dinner entree. If you pair it with a side of mashed potatoes, a salad and veggies like this roasted asparagus, you will have a fast and easy dinner. A whole roasted chicken not only means a lazy Sunday dinner but you can divvy it up for take-to-work meal preps in salads or sandwiches. Also, try adding leftover chicken to casseroles, pasta dishes or a healthy grain bowl filled with fresh veggies and chicken. We used leftover chicken in our chicken pot pie and it was fabulous. After you have eaten the entire chicken and all that is left are the bones, you can make a lovely chicken bone broth. There are zillions of ideas for this multi-use roasted bird. The objective is to elevate the bird so it is off the bottom of the crockpot while it roasts. You may be surprised at the creative ideas you can come up with. After you stuff the cavity with lemons and herbs, truss its legs together and place it inside the crockpot. Oil the outside of the chicken, season it with herbs or your favorite rub, put the lid on the crockpot and set the time and temperature. Do not add any liquid to the bottom of the crockpot as that will steam the chicken and not roast it. 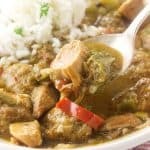 There will be about a cup or more of flavorful, pure chicken juices at the end of the cooking time for some great-tasting sauce if you want. It should take a 4 to 4-1/2 pound chicken about 5 hours on low heat to finish cooking. There are some slight variations among different brands of slow cookers so we recommend that you check the internal temperature with a meat thermometer. When the chicken reaches 165° you will know for sure that it is finished cooking. If you don’t have a meat thermometer then check to see if the juices are clear. But honestly, you really need to get a meat thermometer. 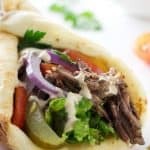 You can get an accurate and affordable meat thermometer for less than $7.00 that will never run out of batteries or for a few quarters more you can get an easy to read digital thermometer. They are so affordable it doesn’t make sense to fumble around without one. 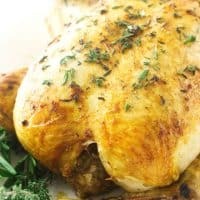 How do I brown a chicken in the slow cooker? Short answer, you don’t! A crockpot is just not going to get that chicken brown. If you want the chicken to be nicely browned then you will have to stick it in a really hot oven at about 500°F for around 5 minutes. You could actually skip this step if you don’t care whether or not the chicken is brown. For instance, if you are going to shred the chicken to use in a salad or to mix with barbecue sauce, then don’t worry about browning the little bird. However, if you want the chicken brown, then crank the heat up on the oven and plop it on a rimmed baking sheet then slide it in the oven. You want to keep a close eye on the bird while it is browning. Since it will already be cooked when you stick it in the oven then you don’t want to cook it any further. The goal is to make it look pretty. At 500°F, it will brown pretty quick so don’t walk away or you will have a burned bird. Let the chicken rest before cutting it. When the chicken is finished cooking and browning, set it on the counter and cover it with some tin foil for 10-minutes before you get out the knife. Oh, I can’t stress how important it is to do this step. When you let the chicken rest under the foil then the juices have time to ‘seal’ inside the meat fibers. 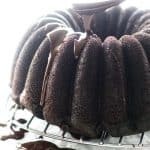 If you slice into it right away without letting it rest then you will lose a lot of the juices and it won’t be as moist and succulent. 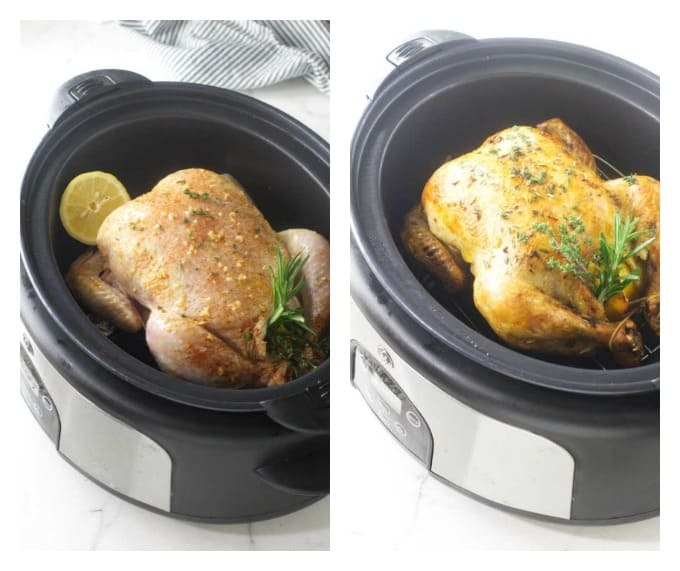 Did you make this recipe for a whole chicken in the crockpot? We would love to hear from you. Drop us a comment below. 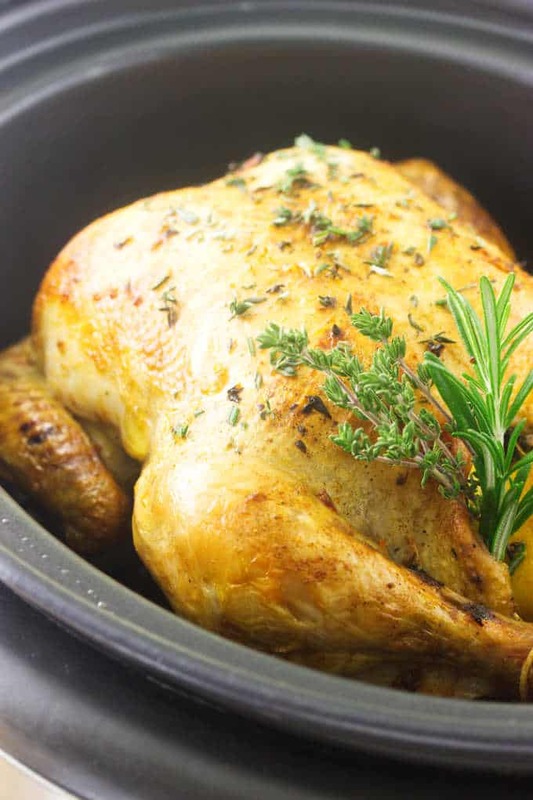 Roasted, tender and juicy whole chicken cooked in the crockpot. 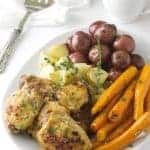 This easy to prepare, chicken is a great base for Sunday or weeknight dinner. Spray a small wire rack with non-stick oil and place in the bottom of the crockpot. Rinse the chicken and pat dry with paper towels. Season the cavity with salt and pepper. Stuff the lemon quarters and all but 3 of the slices into the cavity. Add the sprigs of oregano, thyme and rosemary inside the chicken and tie the legs together with kitchen twine. Place the remaining 3 lemon slices on the bottom of the crockpot. Place the chicken in the crockpot, breast side up on the rack. Brush olive oil over the top and sides of the chicken, season with additional salt and pepper. Sprinkle with the chopped oregano, thyme and rosemary. Put the lid securely on the crockpot and set the temperature to low and roast for 5 hours, or until internal temperature reaches 165°F with a meat thermometer. Remove the chicken from the crockpot and transfer to a wire rack set over a rimmed baking sheet. Place in the center of the oven and watch closely for 5-8 minutes until the skin turns golden brown. 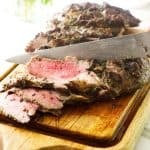 Transfer to a cutting board, tent with foil and let rest for 10 minutes. Remove the lemon pieces and herbs from the cavity. Carve the chicken and place on a serving platter. Garnish with chopped parsley when ready to serve. While the chicken is resting, discard the lemon slices and pour the accumulated pan juice remaining in the crockpot through a fine-mesh strainer set over a small saucepan. Bring to a low boil over medium-high heat. Combine the cornstarch with the water and whisk the slurry into the pan juices. Transfer to a dish, season with salt and pepper, and serve with the chicken. If you don't have a rack for the crockpot, a small round kitchen trivet fits nicely in a standard crockpot. Do not lift the lid of the crockpot until the cooking time has finished. There will be about 1 cup of accumulated pan juices for sauce if desired. Nutrition values do not include sauce.